were great astrologers who followed a prophet known as Zoroaster. This ancient mystical religion, which still exists today, also believed in the coming of a Messiah. Each culture has its own religion, and this is how it was meant to be. None-the-less, regardless of our culture, the same Sun shines on everyone, and the same Natural Laws govern our destiny. is true in one religion, is absolutely true in all. Unfortunately those who wage war in the name of religion are blinded to this truth. A time to love, a time to hate, a time of war, and a time of peace. How do we Reconcile Jyotish with Christianity? As long as we are in this world we all, no matter what our religion, are in the same grip of karma which is governed and maintained, from birth to death, by the navagrahas. None can escape this and, even for the self-realised, karma must play itself out...this is the indisputable law of nature (Natural Law). Death however brings an end to this particular cycle of existence and our future existence is determined greatly by our actions in this life. The crucifixion is the cornerstone of Christianity; And this, as we see, undoubtedly connects Christianity with the jyotish ritual of yajna which is offered for the eleviation of suffering. "The pain which is yet to come can and should be avoided." Although the practice of astrology is generally discouraged by the modern-day Church, it was known and extensively practiced prior to this current era and certainly so in the early Church itself. The argument was generally over how, and how much, and what was right and proper to do with that knowledge. "Natural astrology", and the wholesale influence of the Sun, Moon, and Stars over everything from the weather to the infirmities of the body, was rarely the cause of contention. "The majority of men follow their passions, which are movements of the sensitive appetite, in which movements of the heavenly bodies can cooperate; but few are wise enough to resist these passions. Consequently astrologers are able to foretell the truth in the majority of cases, especially in a general way; for nothing prevents man resisting his passions by his free-will. Wherefore the astrologers themselves are wont to say that ‘the wise man is stronger than the stars'." Clearly states that the prophet Daniel was "learned" in the knowledge of the chaldean astrologers and that he was in fact made "king of the astrologers". He served first the Babylonian Emperor Nebuchadnezzar and then the Persian conqueror Cyrus around 570 - 530 B.C. The Jewish Midrash, the name given to certain collections of writings that are ordered around the layout of the Tanach, supports the notion that Abraham too was an astrologer. One (of several) astrological references is found in Gen 17:15 where God orders Abraham to change his wife's name from Sarai to Sarah in order that she conceive a child. It is a Jewish custom that changing or adding a name blesses that person with a "new" horoscope, a new beginning - It's said that Sarah was ninety years old. It is believed that a change in name brings about a change in destiny. When a woman is married, for instance, she takes on the name of her husband and her status changes. The horoscope drawn for the time of marriage has a very real influence (for better or worse) on her origonal horoscope. In this same way we see the destiny of nations change when they emerge as a newly independent nation. 1. The heavens declare the glory of God; and the firmament sheweth his handywork. 2. Day unto day uttereth speech, and night unto night sheweth knowledge. 3. There is no speech or knowledge, where their voice is not heard. 4. Their line is gone out through all the earth, and their words to the end of the world. In them has he set a tabernacle for the Sun. "He telleth the number of the stars; he calleth them all by their names." "2:1. Now when Jesus was born in Bethlehem of Judaea in the days of Herod the king, behold, there came wise men from the east to Jerusalem, 2:2 Saying, Where is he that is born King of the Jews? for we have seen his star in the east, and are come to worship him." "When it is evening, ye say, It will be fair weather: for the sky is red. And in the morning, It will be foul weather today: for the sky is red and lowring. O ye hypocrites, ye can discern the face of the sky; but can ye not discern the signs of the times?" 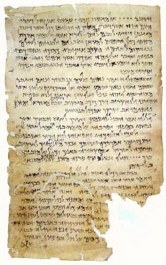 The Dead Sea Scrolls, discovered in 1947 by young Bedouin shepherds, were written in the Semitic language of Aramaic between 250 B.C. and 68 A.D. They were hidden in caves near Qumran, believed to be an ancient Jewish settlement inhabited by the Essenes. The writings shed light on aspects of early Jewish religious and secular life during the era when the Romans sacked Jerusalem, around A.D. 70, and as Christianity was dawning. The Qumran text (shown) includes five biblical quotations connected by interpretation. The first two quotations refer to the raising up of a prophet like Moses. The third quotation refers to a royal Messiah, the fourth to a priestly Messiah. The quotation from Joshua is connected to the coming of a time of great disaster, brought on by those dedicated to evil. The manuscript is usually dated to the middle of the first century B.C. The Essenes were a strict Torah observant, Messianic, apocalyptic, baptist, wilderness, new covenant Jewish sect, who had a great understanding of Astrology. One of the scrolls describes the influence of the heavenly bodies on the physical and spiritual characteristics of those in certain sections of the zodiac. Many of the Essenes were great prophets of the future and were seldom wrong in their predictions. The Scrolls can be divided into two categories - biblical and non-biblical. Fragments of every book of the Hebrew canon (Old Testament) have been discovered except for the book of Esther. It is for this reason, and especially because the Qumran scrolls are the oldest known copies of Jewish scripture in existence, that they, and the sect that produced them, are considered so vital to the study of Judaism and Christianity. There is no question that the New Testament is a doctrine of faith (built on the messianic teaching of Christ) rather than knowledge. The central teaching of Christ was The Kingdom of God within that transcends all intellectual knowing. yonder place; and it shall remove; and nothing shall be impossible unto you." Intellectual knowledge and faith, although complimentary, are vastly different, and with only three years allotted him for his ministry, Christ's potent message was one of faith and salvation. Christ's brief ministry was a preparation for the greatest sacrifice (yajna) ever offered on behalf of mankind; and, as the time of his crucifixion drew near, he suffered all the torments of humanity (for humanity) and prayed to God to take the burden from him;"Take this cup from me", he cried. 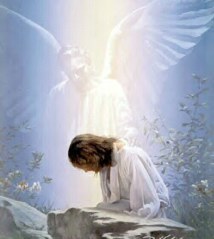 Then he uttered the words; "Not my will; but thine be done", and straightway an angel from heaven came down to comfort him. Many of our New Age Gurus (for want of a better term) teach this principle of surrender - complete surrender to the Will of God. We all suffer in the wheel of karma but, as Christ revealed, we can always find comfort in prayer. This fundamental truth is the corner-stone of all religions. Guardian angels are prominent in every culture and creed. The little morning prayer (below) would, I'm sure, reflect the teaching of many religions - that none need suffer alone in the darkness of despair; comfort is always near. to light and guard, to rule and guide"
I know, by all the mails from people wanting to know when they can get a job or when they'll be married, just how hard it is to surrender when facing unemployment or any of the other seemingly insurmountable challenges of life. Without fail all want a remedy to alleviate their affliction... This is human nature, no-one wants to suffer. The Holy Science is a book written by Swami Sri Yukteswar Giri in 1894. 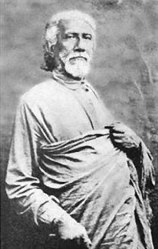 Sri Yukteswar states that he wrote The Holy Science at the request of Mahavatar Babaji. "The purpose of this book is to show as clearly as possible that there is an essential unity in all religions; that there is no difference in the truths inculcated by the various faiths; that there is but one method by which the world, both external and internal, has evolved; and that there is but one Goal admitted by all scriptures." Specifically, Sri Yukteswar demonstrates the underlying unity between Sanatan Dharma and Christianity, by comparing Sanskrit slokas to passages from the New Testament, especially the Book of Revelation. An interesting event took place when Vivekananda was staying at Thousand Island Park. It was a dark and rainy night. A few ladies from Detroit had travelled hundreds of miles to find him there. Having met him, one of them humbly spoke out, “We have come to you just as we would go to Jesus if he were still on the earth and ask him to teach us." All True Spiritual Masters honor the divinity of Jesus Christ. "Be thou happy by this yajna [sacrifice] because its performance will bestow upon you all desirable things." We're told that the effects of a yajna are felt on not just the physical, mental, psychic or spiritual levels but on the supramental levels as well. 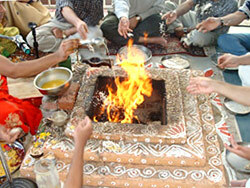 A Yajna is an esoteric act and thus penetrates deep into the area of mysticism. In Vedic Civilizations, Yagyas were part of the regular routine of individual and public life. They are mentioned often in the Vedic Texts which describe their beneficial effects. The Vishnu Purana, for example, explains that: ‘Performance of Yagyas day by day is beneficial to man and bestows peace’ (1.6.28). 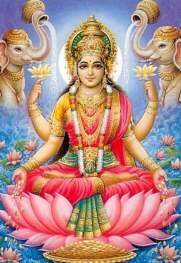 According to the Laws of Nature, we're all held accountable for our past actions (karma) and, as astrologers familiar with the principle of remedial measures to alleviate negative karma (remission of sins), we also know that such remedies are often out of reach for those most in need - the poor and afflicted! Yajnas (offerings/sacrifice) performed by priests on our behalf, and Gems for afflicted planets, can cost a great deal. 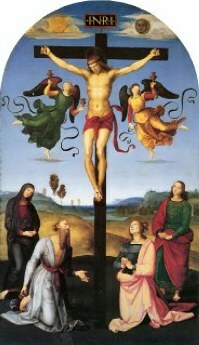 Christians believe that the greatest sacrifice ever offered was the crucifixion of Christ. 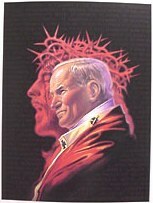 He, born without the stain of sin, offered himself as the supreme sacrifice for the atonement of our sins (karma). It goes without saying that the power of the yajna is in accord with the level of consciousness (state of awareness) of those who offer it. This is why Christ's crucifixion remains as valid today as it did over 2000 years ago. “I exist everywhere, in every time, in every object, every form. But especially in those who know me in love and delight. All existence is universal consciousness absorbed in the highest bliss. And the bliss grows. And greater bliss. "I am the Mother of the universe, and I love you all, every atom of my manifestation. Not one of you is different from me...pure consciousness." The blessed virgin Mary, mother of Christ (prayed to as the Mother of God) is shown here as she appeared to Saint Catherine Laboure. "Her feet rested on a white globe. I saw rings on her fingers, and each ring was set with gems. The larger gems emitted greater rays and the smaller gems, smaller rays. I could not express what I saw, the beauty and the brilliance of the dazzling rays. A voice said, "They are the symbols of the graces I shed upon those who ask for them." 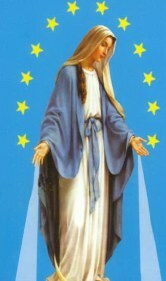 The Holy Mother of Christ is revered by Christians as the Queen of Heaven. As we know, Moon, representing Mother (universally), has been assigned the status of Queen. Each year millions of devotees visit Vailankanni, a small town in the south of India to pay homage to The Blessed Mother Mary, in the magnificent Shrine Basilica of Our Lady of Vailankanni. Singing Hymns and chanting "Ave Maria" (Hail Mary). 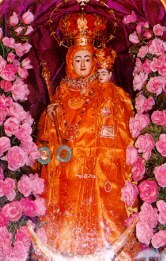 Many of the devotees make the pilgrimage on foot from their homes, some as far as 200 miles away, to show their love and devotion to their "Vailankanni Matha" (Vailankanni Mother). Many are not Catholic or even Christian for that matter. An overwhelming majority of the devotees visiting the Vailankanni Shrine are non-Christian. They bring gifts of flowers and coconuts; many shave their heads in keeping with an ancient Hindu tradition of offering their hair as a symbolic gesture of utmost sacrifice. Dom John Main, a Benedictine monk who introduced the simple technique of Christian (mantra) meditation world-wide, was hailed by the great mystic Bede Griffiths as the church's most important spiritual guide of this era. He brought to the people a simple tradition of silent, contemplative prayer in the teachings of the early Christian monks, the Desert Fathers. It became clear to him that this tradition had relevance today, not only for monks, but for all people. "You just sit still and it is in that stillness that you gain the wisdom to see that you can only be yourself, you can only become yourself who is the person you are created to be, if you are willing to lose yourself. The truth that you can discover from your own experience is this--that any one of us can only find ourselves in the other. No amount of self-analysis or self-examination will ever reveal to you who you are. But if you can take the focus of your attention off yourself and project it forward then you will discover the other and in discovering the other, you will discover yourself. The other is the Ground of All Being, the other we call God, Supreme Wisdom, Supreme Being, Supreme Love. The name is not important. Indeed, in meditation and in the silence of it, the complete silence of it, we go beyond all words, to the Reality." So it is that mantra meditation, thought by many to be the exclusive domain of eastern gurus, has long been a tradition within the community of Christian monks. The Holy tradition of Popes as the head of Christ's church has continued from the time when Christ instructed his disciple (Peter) that he was to be the "Rock" upon which the church would be built. This Holy tradition has continued for 2000 years. Those familiar with the parampara tradition should have no difficulty understanding the reverence that is shown to the Pope; He represents an unbroken line from Peter who was ordained by Christ himself. The world has shifted gear today and sad it is that many Westerners (and indeed Christians), whilst honoring the Hindu parampara tradition, often denigrate the same Holy tradition upon which the Christian church is built.